I saw Giada make a version of this when i was mindlessly watching the food network while cooking one night. Hers seemed too cheesy (especially since I wasn’t supposed to be eating dairy–or at least minimizing it). So I modified it. Pour the balsamic, olive oil, garlic, and rosemary or basil into the baggie. Toss in the mushrooms. Seal and then shake. Let sit for a half hour (longer is better if you have time) to marinate. Put mushrooms onto the grill pan. And grill each side for a few mins til semi cooked. Pour 1 ladle of sauce into an oven proof dish . Place mushrooms on top gill side up. Put 1 spoon of pesto into center of each mushroom. Top with Parmesan and 1 ladle of sauce. Bake at 350 for 15-20 mins (melt cheese, let flavored come together. Serve with some angel hair pasta, sauce, and some wine. 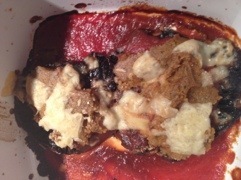 This entry was posted in Recipes, side and tagged CSA, parmesan, portabella, vegetarian. Bookmark the permalink.